Adhering to our mission, Jewelxy offers an exclusive B2B, B2C and O2O Gems and Jewelry marketplace with the advantage of remarkable opportunities to the Businesses where Jewellery Retailers, Manufacturers, Suppliers as well as Wholesalers could indulge themselves in the Global Business Network Platform to fasten the deals and showcase their skills at the most appropriate platform. Help businesses to be found on global market. Bridge between buyers and sellers. Advertise / discover new product and services. Business performance reports and analytics. Up-to-date industry trends and happenings. 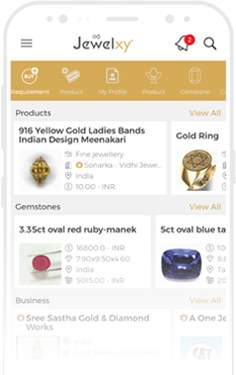 Jewelxy.com is the right platform which facilitates two-way search that empowers your business to pursue desired results.